If your GE dishwasher isn’t draining, this cheat sheet will step you through the most common causes. First check is underneath the sump entrance screen (item 4 in this thumbnail — click for a larger view). Remove the one or two screws on the cover to remove and check for gookus– anything that shouldn’t be there. 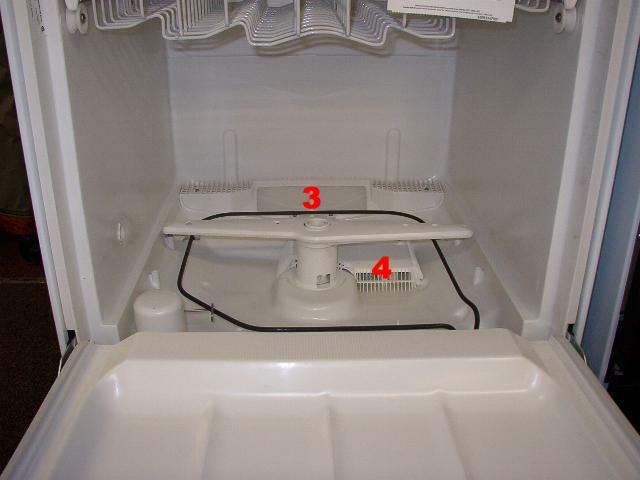 Many GE dishwashers have a self clean filter (item 3) inside the basin, at the back. The draining water must pass through a plunger in the self clean filter body. This can get clogged up, or the plunger may twist and distort and not allow the draining water to get past. The filter can be removed from the inside and the plunger will twist out of the self cleaning body for testing/checking. 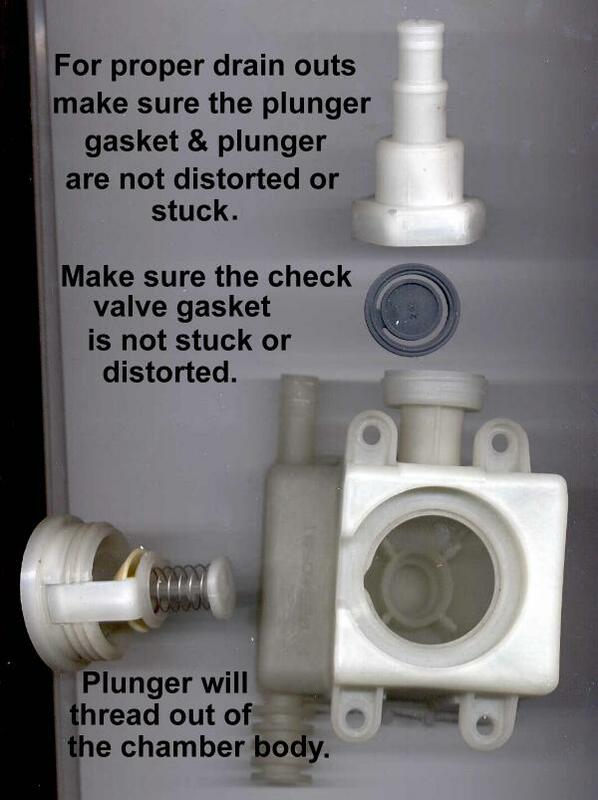 For additional information on this filter plunger/piston check valve assembly, see this post. Part link for the piston check valve assembly is ratcheer. The next obstacle for draining water is the back flush valve (item 2 in this thumbnail– click for a larger view). This valve can twist or distort and block the water flow as well. You’ll need to get to the drain port to check this flapper valve– it simply untwists from the self clean filter body. All hoses between the items mentioned above and the drain hose itself all the way to the house plumbing should be checked for restrictions. 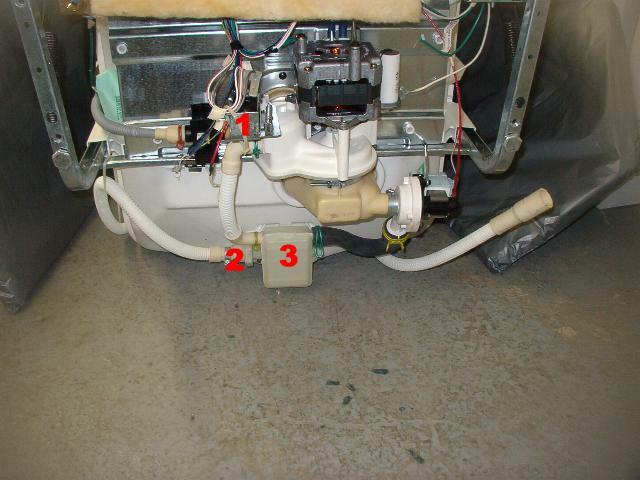 Some newer GE dishwashers have a separate drain pump and motor; the older models, however, used a drain solenoid valve (item 1 in the above thumbnail). If this solenoid fails, the dishwasher won’t drain, plain and simple. If the solenoid cannot pull in the silver plunger, the drain port will not open to allow the motor and pump assembly to drain the water out. Use your ohm meter to test the continuity of the solenoid coil. You should also test to see if it’s receiving 120vac when the dishwasher is supposed to be draining. For help using a meter to make simple electrical measurements, see this post. This entry was posted in Dishwasher Repair on July 4, 2006 by Samurai Appliance Repair Man. After checking all the ‘easy’ stuff, I popped the grating off the sump and dug around in there. My fingers were barely long enough to hit bottom, but I pulled out a ridiculously small piece of porcelain that’d chipped off a plate, but apparently was large enough to block the flow enough to leave a good 2-3″ of nasty standing water in the washer tub. The blockage was maybe 2/3rds the size of a dime? So it really doesn’t take much.